Noblemania: “Addicted to Love” women: first reunion since 1986 shoot! 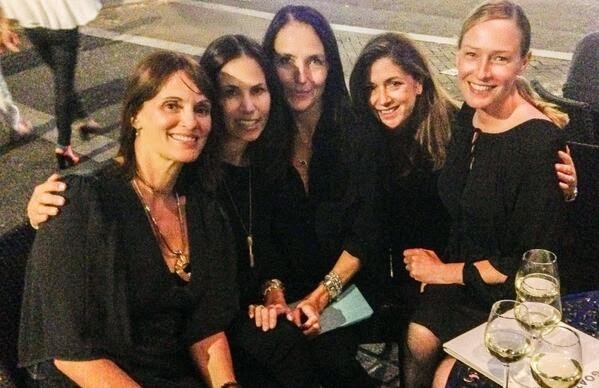 “Addicted to Love” women: first reunion since 1986 shoot! Last year, I became the first person to track down and interview all five women from the iconic Robert Palmer “Addicted to Love” video. Gonna have to face it...that is totally cool. Posted 12:59 PM Labels series: '80s music video icons, where are they now? That is awesome! Thanks, Mark! Thanks Lori. You have not seen it in ROLLING STONE or elsewhere because I got there first! As we used to say back in the day, TOTALLY awesome! Maybe even tubular! Good work, Mark! They all still look awesome too. I am McG, in Texas, 61 and still impressed by these five fine ladies! I saw the Robert Palmer videos sometime in the 80's, kind of an MTV "Outlaws Tribute" I think. Not long after, I recall seeing the Simply Irresistible Pepsi Cola commercial. That it was RP and "that type" of makeup had me looking to see if any of the women in it were also in the Addicted To Love RP video. Julie Pankhurst was obvious. Not that her slicked back red lips pancake base face looks much like her real appearance; she looks awesome both natural and made up! This said, I finally got to wondering who the people were that 'starred' in these videos, and went for Google search which landed me in YouTube to see some of the vids. Links listed in comments got me here. I am pleasantly impressed with all five of these young people, where they've been and where they are now. While the staging of the vids were totally mesmerizing at first, I came to consider what it meant in real human terms. I think the videos really do push one to that direction of thinking. I enjoyed learning a bit about these people, thanks for doing this, whoever did!